Mid-Winter Doldrums – What’s a guy to do? Here we are deep into the month of February. Some years we are beginning to moderate weather-wise by mid-February but not so much this year. We just received about 4 inches of light fluffy snow. Temperatures are in the single digits and staying below freezing throughout the day. Definitely not shooting weather in mid-Missouri. I hauled in my trail cams last weekend, prematurely I might add. Our January weather was more like late March so I figured I’d grab the cameras before they got flooded or whatever happens to things left outdoors for extended periods of time. I did notice some new trails and thought about just moving a camera or two but decided against that, unfortunately I might add. When I got home and checked my SD cards only one was very active but there was a very nice 13 pointer posed in several different positions. He was a newcomer to my area. So now I need to reset a couple of cams to cover these new trails. Who knows what else might be lurking out there. It would be interesting to see how long the bucks carry their antlers. I have found trail cameras to be an excellent hobby. Well placed cameras can tell you a great deal about what is going on in your woods that was previously unnoticed. They are there day and night. Besides keeping track of your favorite buck odds are there is another buck or two that you haven’t had the opportunity to see. Maybe even bigger than the one you knew about. But beware, during the rut some bucks are travelers and you may catch them a couple of times and then they are gone, on to find more girl friends or fewer suitors. Over the years, if you are lucky, you may get to see some of your recognizable bucks grow from spikes to majestic rulers of their domains. My friend Carl Smith got me started by showing me some game pictures. He uses cameras to cover his lease in South Carolina and suggested I start with the Cuddeback cameras and I have not been disappointed. I much prefer the strobe type flash however. The low-light to dark pictures are much higher quality and in full color with the flash units. I think the newer models have better battery life than my 5 year old units but the old units are still in very good condition. They seem to withstand the weeks outdoors unprotected unscathed and are still very serviceable. So one afternoon of each weekend from October thru mid to late February is dedicated to at least a couple of hours in the field checking trails and trading out SD cards. It is a great opportunity be outdoors and get some exercise, sometimes with the dogs and sometimes solo. It is also a good time to do additional scouting. Come to think of it maybe I’ll put one out a little later in the spring so I see where those dang morel mushrooms are hiding. 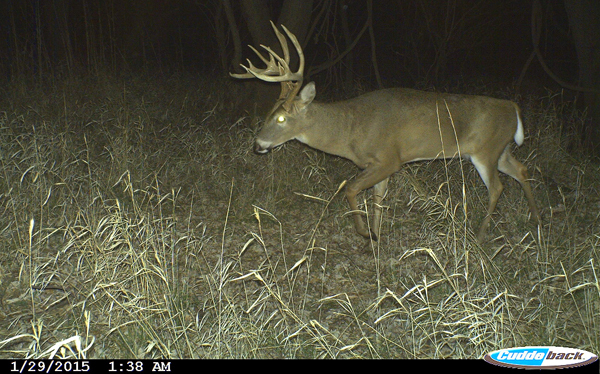 This entry was posted in Hunting Stories and tagged Cuddeback camera, deer camera, game cam, trail cam, trail camera. Bookmark the permalink. 1 Response to Mid-Winter Doldrums – What’s a guy to do?